The auction will take place over the course of two days on June 15th and 16th in Beverly Hills and will feature an assortment of fantastic items that were near and dear to the star himself. Highlights included his last two passports, a California driver’s license, a 1970s-era Fire Arms license where it’s obvious he’s a movie star when looking at his ID photo, countless awards and citations from a lifetime of achievement, huge and gaudy belt buckles and cowboy boots that were part of his signature look for decades, and many wardrobe pieces worn to red carpet events and public outings. Of special interest is a massive collection of memorabilia related to Florida State University, Reynolds’ beloved alma mater where he played football as #22. He maintained a lifelong relationship with the university and was one of its best known and most beloved students. On offer will be clothing, awards, jewelry, home décor and football items all in the signature garnet and gold colors with many pieces featuring the famous Seminole logo. 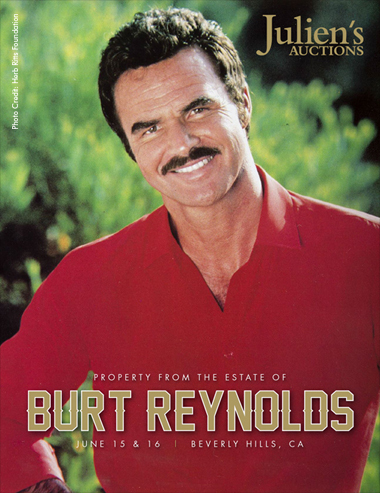 So many other items from Burt’s life will be available with estimates ranging from $25 to $200,000 – a “something for everyone” type of auction that we hope you’ll participate in!